That's the message we've all been waiting for. 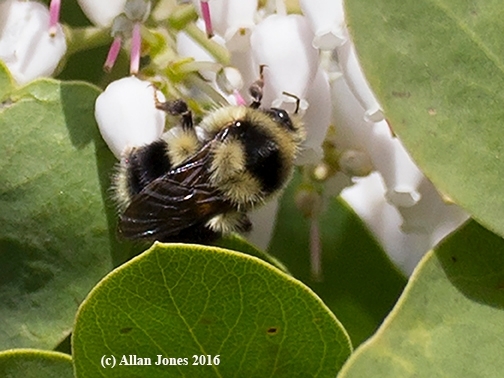 Several of us bumble bee enthusiasts--Robbin Thorp, distinguished emeritus professor of entomology at UC Davis, photographers Allan Jones and Gary Zamzow of Davis, and yours truly--have been searching for the first bumble bee of the year since...well...Jan. 1. 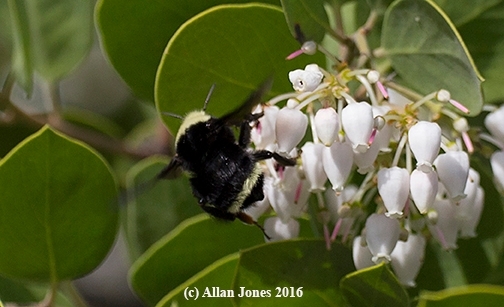 We've been hanging out near manzanita bushes, knowing that this is usually the place to find newly emerged bumble bees this time of year. So today, Jones won. 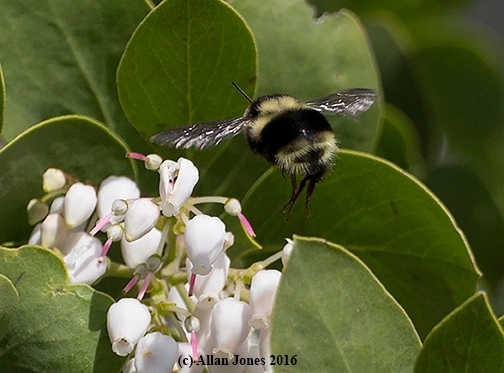 He headed over to "two beautiful manzanitas" near the off-ramps at Russell and Route 113, Davis, and spotted both the yellow-faced bumble bee, Bombus vosnesenskii, and the three-banded bumble bee, Bombus melanopygus. He captured these images (below) at noon. "I believe they are also at Hutchinson and 113, but I did not need to go that far," Jones mentioned. "The bees seemed very wary and were high overhead so I was only able to get record shots." Good job, Allan! You nailed it! And just in time for Valentine's Day. Note: If you want to learn more about bumble bees, check out Bumble Bees of North America: An Identification Guide (Princeton University Press) and California Bees and Blooms: A Guide for Gardeners and Naturalists (Heyday) both co-authored by Robbin Thorp and other scientists.